The phrase “flip the script” has become a part of the vernacular as an expression of a 180-degree change in the expected course of action. Oddly enough, even though there is a cinematic connotation to this expression you rarely see a film that exemplifies this expression. Megamind is that kind of a film. While you can’t claim it’s wildly original it does set up certain expectations and exploits them very well. What is refreshing is that not only do you get a villain-turned-hero but you also have a new villain emerging from an unexpected source. You also have a reluctant hero who fades completely into the background and doesn’t make a triumphant return. The film absolutely refuses to be overly-simplistic and didactic in showing why those who turned villainous did and why there was a change in our protagonist and how. It also nicely implies that heroism was, in fact, Megamind’s fate, as we never learn what his parents said to him before sending him off to Earth. It ended up being circumstance and not reacting to it well that lead him down the path he took. 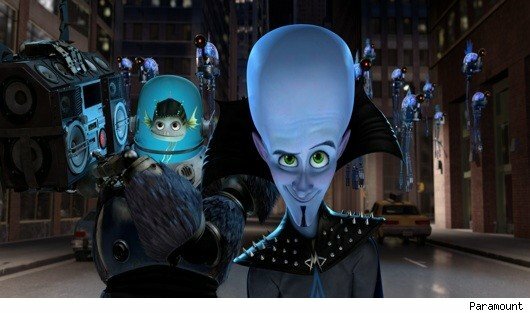 What is also good to see is that as Megamind disguises himself to try and gain a new rival there is a great treatment of the “Bad Friend Plot.” This occurs with a rift between Megmind and Minion. There is no failed attempt to reconcile and when they do reunite it is surprising and satisfying, avoiding unnecessary convolution of the story. While the film clearly excels in dramatic terms it is also rather successful on the comedic side of the equation and the comedy excels more often than not. Megamind’s mispronunciations, while hit-or-miss, do play a key role in the film. While this is yet another animated film that insists on boasting name recognition in its voice talent with Will Ferrell, Tina Fey, Jonah Hill and Brad Pitt, they do all commit themselves to their character work enough that eventually you do think of them in terms of their character and not the performer. It just takes a little time. Which is also a tribute to the writing in this film. Aside from the many interesting variations on themes that you get there are also clearly defined characters with struggles, needs and wants that you identify with and this is true of all the significant personages. The animation in this film is quite impressive with the great cityscapes it creates and in terms of the 3D there are worst purchases you could make at the movies this year. Megamind is out on DVD today.